Fickle Feline: lunch prep gone bananas. As part of my own personal happiness project/resolution to find my joy in 2011 (official site here), I am tackling a few items at a time. The most important thing I am focusing on is my mental health. The two tactics I'm using for this are exercising every day with P90X, and getting to bed early every night. If I manage to do those two things and I'm feeling ambitious, I am also trying to be more organized so that I don't get stressed out about stuff like packing lunches in the morning. As you may recall, Max takes quite a bit of food with him each day (he needs enough to cover off snack and lunch for junior kindergarten and a snack for his afternoon therapy. In addition, I have always been a fan of packing healthy snacks for myself to take to work. I like to eat well and I hate to spend money on lunch. The combined time of packing both Max and my food for the day is over 20 minutes (which I never have in the morning so we're always late). This Sunday I decided to prepare all of our fruits and vegetables for the first half of the week at once. It only took 20 minutes - so I saved myself 40 minutes and a lot of morning stress. The containers with the red lids and oranges are for me, and the labelled containers are for Max. I still make sandwiches in the morning because I can't stand refrigerated bread and it only takes 2 minutes to slap them together. I sure am glad I don't have to pack a lunch for Cam yet! What do you do to make your mornings less stressful? Love the labelling! Reminds me that I need to order more Allergy labels for Ronan! I try every evening to lay out the kid's clothes for the next morning, pack backpacks/diaper bags and organize lunches (or at least have a plan of what to pack in the morning). Because of Ronan's allergies I have to send everything he eats with him to daycare so it takes some planning to make sure I have wheat-free/nut-free foods in the house. If it wasn't for that I doubt I'd think ahead as much! Jenn White Topliff 2:02 a.m. SERIOUSLY... could not be more impressed. 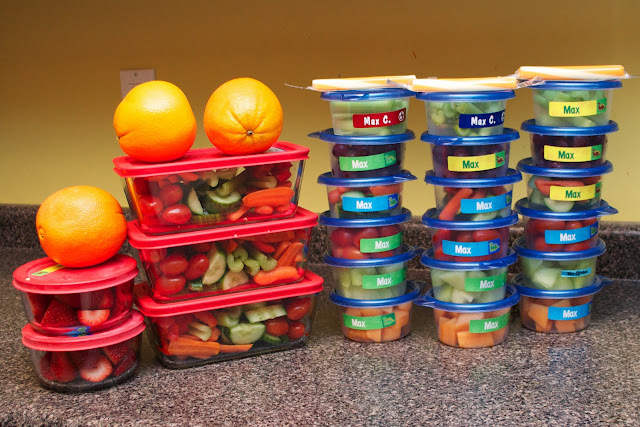 Holy crap - that is some genius snack-organization. I'm blown away. We lose HOURS to lunch-making in the mornings because I'm always such a slug at night, before bed. I can lay out Grace & Hazel's clothes no prob, but by the time I get back downstairs from putting them to bed, I'm far too tired to start messing around with lunch and snacks and everything else. Anyway, way to go... that looks SO beautiful! Enjoy your healthy nibbles!